Avoid a slew of problems and take a few minutes to instruct your children on the finer points of greeting new dogs. Kids and dogs go together like peas in a pod. In the right environment, they can become best friends for life, a joy many of us experience every day. However, for children, it’s sometimes different. They can develop fears of dogs for reasons both in and out of our control. Regardless of how they establish this phobia, though, it’s important to address those fears head-on. If your child hides or panics when faced with a dog, follow these steps to help them relax and enjoy the company of some of the most loyal animals on earth. Before moving on to a solution, address the root problem: Why is your child afraid of dogs in the first place? If they were bitten by a dog in the past, it’s probably obvious where their fear stems from. If not, do a little digging. What have their past interactions with dogs been like? Were the dogs young or old, laid-back or rowdy? Your child could be reacting based off how dogs interacted with them because, sometimes, dogs are scared of children too. Also, consider how you react around dogs. Are you scared or uneasy, or do you openly speak positively of them? Kids pick up on your behaviors and opinions more than you realize. Take a step back and consider — could you be at the root of their fears? Whatever the reason, understanding why your child is afraid will let you speak directly to the problem and have a better chance of fixing it all together. Forcing your child to spend time with dogs can add to their fears rather than relieve them. Instead of trying the “all or nothing” approach, take your time helping them overcome their fear. Taking baby steps to solve the issue will return long-term results. Start by talking about dogs in a positive way, or even looking at fun pictures of them online (ones wearing costumes are the best). Once your kid is comfortable with the thought of them, try moving on to the next steps. Head to the nearest park to watch other dogs and their people play. It sounds simple — because it is. By commenting on the little things, your child will be able to shift their focus from fear to observation and curiosity. Another fun tactic? Play a game of “I Spy” next time you’re at the park. Have your child spot things like a dog’s wagging tail, a drooling tongue or a colorful bandanna. Dogs speak a different language from us (and especially your child). In the animal world, eye-level stares, quick movements and full-body hugs from strangers are seen as scary or offensive. If your child interacts with dogs in these ways, the end result could establish their fears even further. Teach them how to control themselves around dogs, including movements and volume. Even better, demonstrate it — let your kid watch you interact with a dog. Letting the dog come to you. Greeting with a relaxed, outstretched hand (try palm down first). Keeping sudden movements under control. Speaking softly and using the dog’s name. Petting gently before bigger hugs. Always asking for permission first. 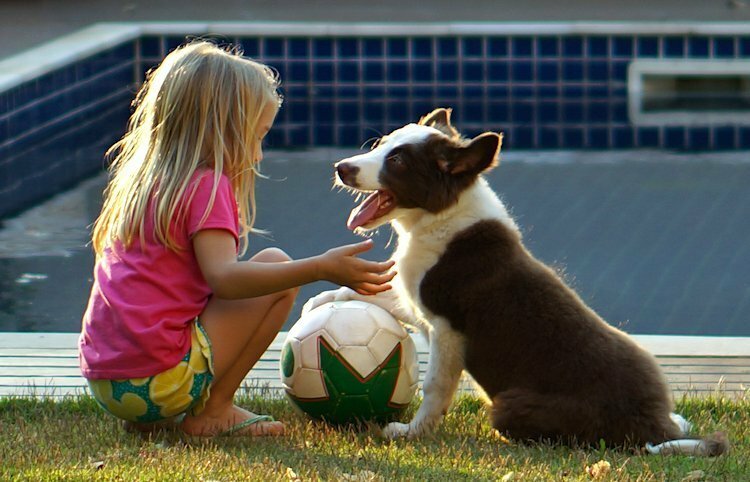 Once your child can speak a dog’s language, their interactions will become more relaxed and comfortable. For a visual tool, try using Dr. Sophia Yin’s poster on teaching kids how not to interact with dogs. Once your child is up for it, schedule a meet-and-greet. Reach out to friends or family with dogs to set up a play date. Keep in mind, pairing your fearful child with a rambunctious puppy might not be the best place to start. Seek out adult dogs who are well-behaved and laid-back. Remind your child to speak the dog’s language, and keep building from there. While the process of overcoming a fear of dogs might be lengthy for your child, it’s well worth it to continue until they’re fully comfortable. Many childhood fears go away on their own, but some stick around and can become debilitating. Put the effort in now to ensure a happy future for your child and any dogs who come into their lives down the road. Here’s a familiar scene: You’re at the park with your pup, and a young child wanders over, her parents nowhere in sight. As she runs gleefully toward your dog, her hands outstretched, you wonder for a moment what will happen. You know your dog won’t hurt her, but you don’t know what this kid is going to do. What’s a toddler doing in the dog park? Why isn’t her mother plastered to her side? What would have happened if the dog she was running at didn’t like kids? Why did her mother tell her to pet the dog without first asking your permission? Why had her mother told her to pet a strange animal at all? Please teach your children proper dog etiquette. If your child spooks a strange dog, not only could your kid get hurt — but also the pet would be blamed and probably suffer greatly as a result. Then model the behavior to reinforce the lesson. Ask the pet’s human if you can meet his animal. 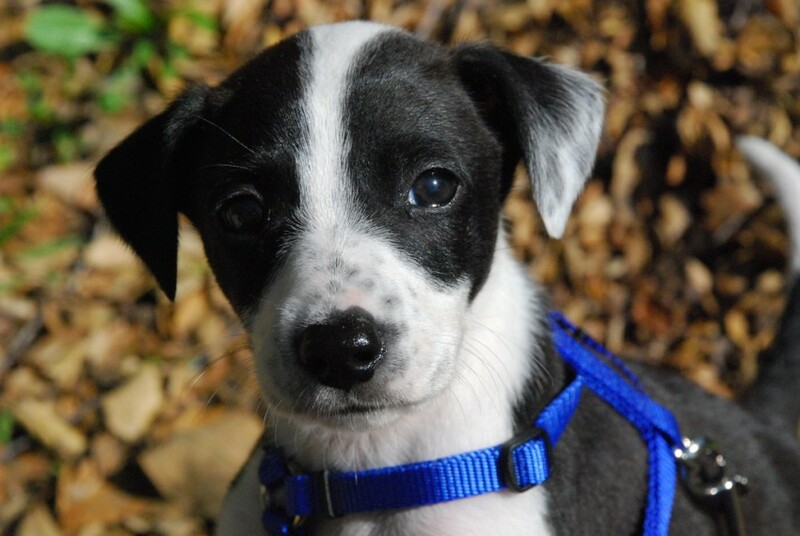 If he says no, don’t press the issue — some dogs become aggressive with strangers and children. If the pet’s human says it’s OK, greet the dog with your arm out in front of you and your hand in a fist, palm down, which will save your fingers if the dog decides to bite you. Hold your fist low so the dog can smell it. If the dog turns away, leave it be. They’re not interested. If the dog leans in or licks your hand, you’ve been given the green light, but proceed slowly. Pet the dog gently, paying attention to their response. If the dog seems eager for more, give them a good back scratch. Keep your child away from the dog’s face, just in case. 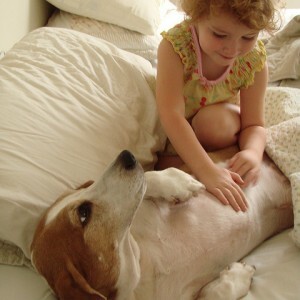 Teach your kid to say “Thank you” to the dog when the child is done petting them — pets appreciate politeness, too. What About Really Big Dogs? Teaching kids about how to approach dogs is one thing. Teaching kids about approaching BIG dogs is another. 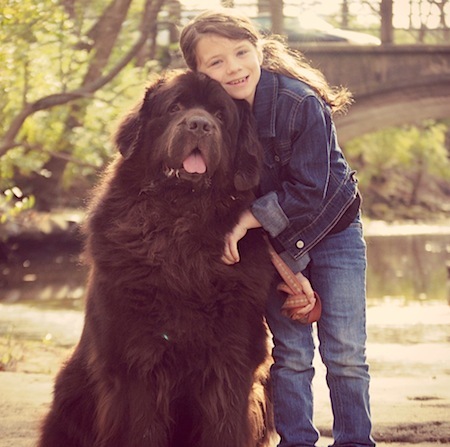 Below are a few tips to emphasize with children who are greeting big dogs for the first time. Kids see my Newfoundlands as big brown teddy bears, so they come bounding toward us. If I see children running full force at one of my dogs, I tell them to stop and walk up to us slowly. I try to explain how running toward a dog can scare them, especially if they aren’t paying attention. Since I have kids, we go to a lot of kid-related functions outside. 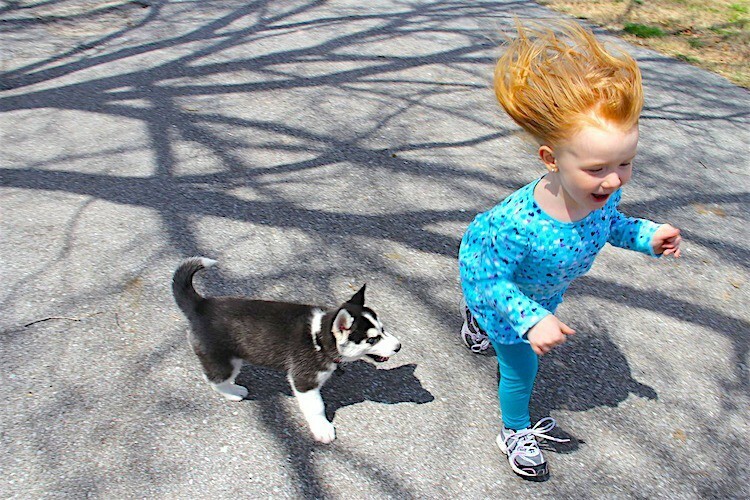 Most children are out releasing their energy, which is great — except when they are standing in front of my dogs and me. I simply ask that they tone it down for a few minutes so the dogs feel more comfortable with them. We usually attract a crowd. Therefore, it’s important that only 1 or 2 children pet the dogs at a time so they don’t get overwhelmed. I don’t know what it is, but kids always want to put their teeny faces right in front of my dogs’ faces and have a conversation with them. It drives me crazy. Not because I think my dogs are going to bite them, but because there is some other dog out there somewhere who will bite them if they do this. So if I can tell them why this is a bad idea, with any luck they will hear me and avoid a future incident. It’s important to teach children to ask permission to pet a dog. Some dogs may not like to be petted, and some dogs might have certain areas they don’t like being touched. And some pet parents, like me, like to be able to put their dog in a sit position before the meeting begins. I have kids put their hands out for the dogs to sniff and then stand to the side of them. Most young kids are smaller or at eye level with my dogs, so I feel if they are standing on the side of the dogs this is less threatening to both the dog and the child. My dogs are big and fluffy, and kids want to touch them everywhere, but I ask that they keep the main touching to the dogs’ torso area and stay away from the ears, mouth, legs and tail. Given that one of my dogs has suffered from major ear infections in the past, he’s not fond of his ears being messed with. I try to spare him the agony of someone tugging on his ears by directing their touch. Sorry, kids — my dogs, my rules.